Your Wellness Score – How Healthy Are You? How to Measure Health and What is the Personalized Wellness Score®? It is getting to the point in the U.S. that we all need a sickness care doctor (your primary care doctor) and a wellness care doctor like us at Revive Chiropractic Centers. The more you go to the wellness care doctor, the less you’ll need the sickness care doctor! How do you know if you’re well? You can’t simply say it’s when you feel good because we all know someone who felt fine one day and dropped dead the next of a heart attack; or the women who felt fine today, but was diagnosed with breast cancer the next. Lack of symptoms or feeling good is no way to measure wellness! So, how do wellness doctors measure your wellness? We measure wellness by what we call The Wellness Score®. This is a scoring system that was developed to track and measure your physiology and function. It actually gives you a grade, A thru F. We measure what we call biomarkers of health. 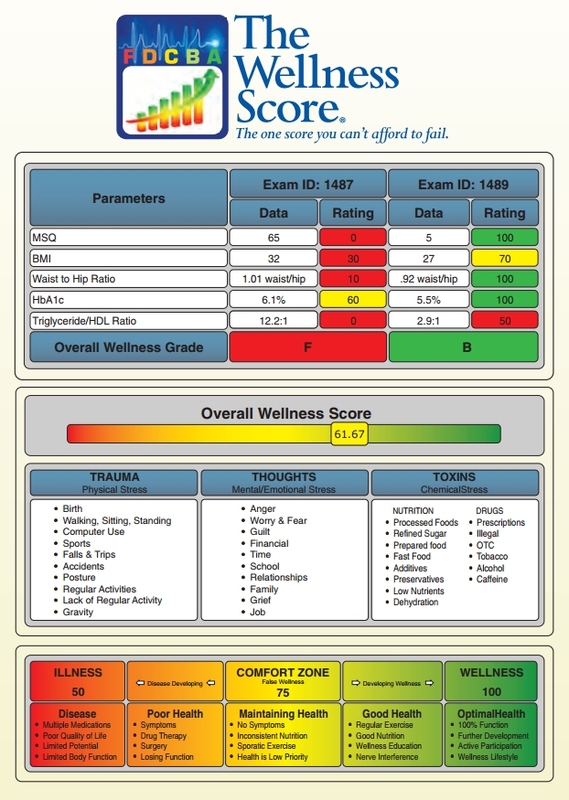 When we do The Wellness Score® on you, we look at numerous biomarkers of health. Call our office to schedule your Wellness Score® with Dr. Nicholas Leverette at Revive Chiropractic Centers. Dr. Nicholas is passionate about helping those in the community. His “whole person approach” includes a combination of detecting underlying interferences that can inhibit your body’s natural healing abilities while also providing you with knowledge, inspiration, and support that is needed to help you along your path to wellness. We measure a total of 28 parameters for a Wellness Score. Most insurance plans will cover this vital health evaluation. If not, our cost to you is $99 (including x-rays). Please call our office to schedule today if you, or a loved one, or a friend hasn’t been evaluated in 3 months or more. This simple wellness score could save a life! It’s a height and weight chart. Yours needs to be below 30 and if it isn’t, you have exponentially increased your risk factor for the 3 biggest killers of Americans- heart disease, cancer, and obesity related conditions such as diabetes. You live your life through your nervous system and your posture tells us exactly what is going on with your spine and nerve system. We take a digital photo of you from the front and side. A picture is worth a 1000 words. We’ll measure 8 different ways to test your strength and flexibility of your core muscles. We sit too much and it’s taking its toll on our bodies. The single best determiner of how well we age is how fat we get. Even if the scale isn’t changing, often our body composition is changing. One pound of muscle burns 3 times as many calories as one pound of fat, yet takes up half the space on your body. Knowing your percentage of body fat is crucial to knowing how WELL you are. As chiropractors, we work with your spine and nerve system to optimize your health. So, it is very practical for us to be able to measure your nerve system. Our heart rate variability test does just that and tells us how well your nerve system is adapting to your environment. 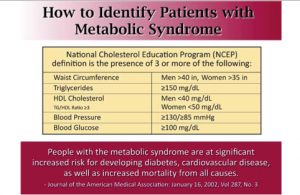 The Wellness Score® can determine if someone has metabolic syndrome, a group of risk factors that occur together and increase the risk for coronary artery disease, stroke, and type 2 diabetes. Revive Chiropractic Centers can turn your health around! 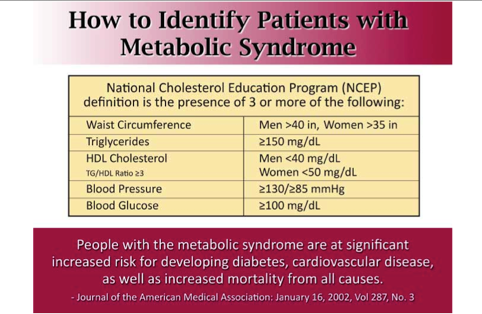 Metabolic syndrome can be reversed with our 8 Weeks to Wellness® Program. The 8 Weeks to Wellness® program is designed to put you back in control of your wellness and help you learn how to live a happier and healthier life. Call Revive Chiropractic Centers at (859) 263-2774 to Get Your Wellness Score!